The glass roof of the covered open-air vegetable market in the city of Chartres is replete with symmetrical lines and angles to meet Cee’s theme for this week (and works particularly well in monochrome). This bus stop was actually adjacent to the watchman’s hut that I featured last week. It’s ‘just’ a bus stop, but I liked the symmetry, the angularity of the shadows and the warm glow of the morning sun through the plastic walls. I was struck by the symmetry of the ornate decoration and the (very) purple colour of this door on an old office building. Something in the human brain is attracted to symmetry; we find it – almost always – aesthetically pleasing. And, as Cee points out this week, it can appear in many different guises. To begin with, here are two images from the Sheikh Zayed Grand Mosque in Abu Dhabi. The first is yet another (no apologies though) chandelier, pictured from below, which is an example of circular symmetry, while the second is the top of a dome, which is obviously an example of left/right symmetry. Although symmetry is an important element of Islamic art, it also features extensively in secular situations in Arab countries. Here is part of the seawall on the Abu Dhabi Corniche and – more prosaically – the underground carpark of the Dubai Mall. It’s also possible to see symmetry in multiple subjects: like these two conjoined kites from the Blond airshow and a set of measuring jugs from a museum in Sarlat. 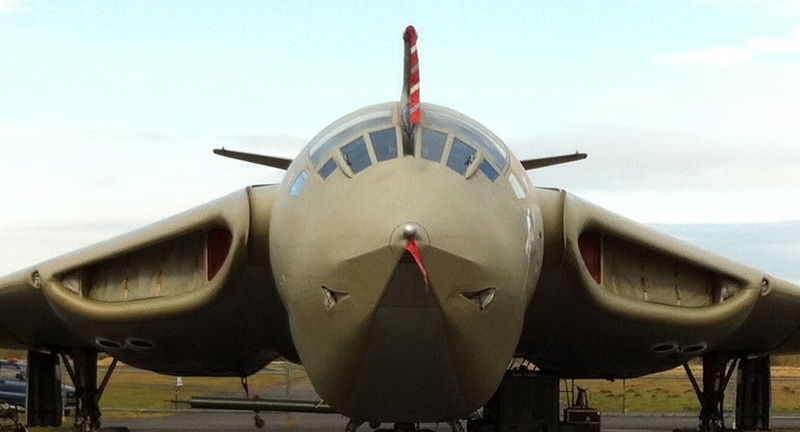 A head-on view of a Victor bomber on display at the Yorkshire Air Museum.